In this "Quick Clip," I'll be using a MOT again (a dual MOT stack) to make deadly flame-looking electricity jumping around midair. This science experiment deals with pulling high voltage and high amperage electricity out into open air, making a plasma stream visible. It's very similar to my Jacob's ladder project. To achieve this effect, I used two MOTs and tied the primaries together in series on a 240 volt system at 30 amps. The secondaries were also tied together in series. Before connecting any power, one end of a secondary was attached to the nail you see in the block of wood, and the other end was connected to a wire I had wrapped around a 4 foot length of PVC pipe. For safety, I used rubber insulated gloves and held onto the PVC tubing far from any of the electrical wiring. One hand was held behind my back at all times to reduce the risk of any accidental shock from going through my heart. Typically, the dual MOT stack should be choked or ballasted. This one was unballasted. In my testing, the circuit breaker never blew, but the MOTs did get very hot, and continued use would have led to failure of the insulation. Use of video content is at own risk. 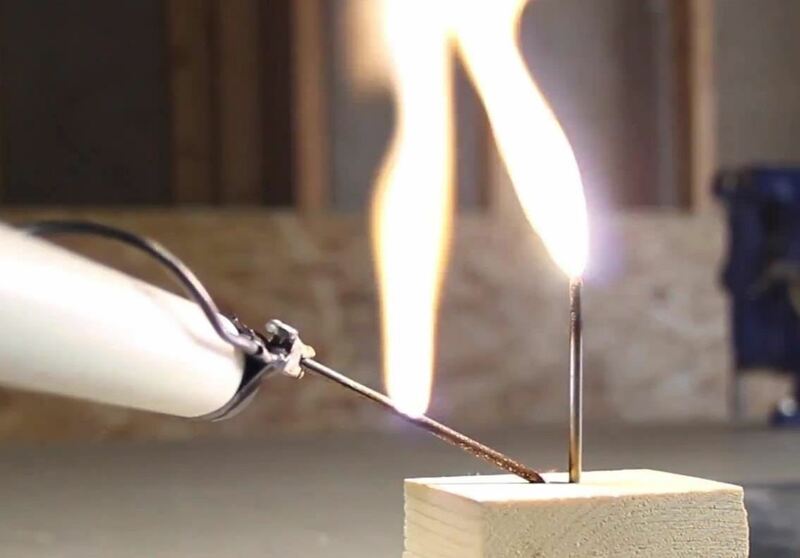 This demonstration uses enough voltage and amperage to kill on contact. This is extremely dangerous and should not be attempted by anyone who is not highly skilled in working with electricity.